These creamy, melt in your mouth white chocolate coconut truffles are quick and easy to make and make a perfect edible Christmas gift for white chocolate fans! A good few years ago, when my boys were younger, I got into making edible Christmas gifts in a big way. I spent months putting together home made hampers full of treats that would give any posh deli a run for their money. I made home made chutney, jams, granola, toffee, cupcakes, cookies – looking back, I probably went a tad overboard. It’s no wonder I used to collapse in an exhausted heap on Christmas day at 6pm! Don’t get me wrong, the look on my families faces when they opened the hampers made the hard worth SO worth it. Sadly, I no longer have the time or energy to make such fancy gift hampers, but I still like to rustle up a few treats for extra gifts. I mean come on, who wouldn’t love to be presented with a box of sugar crusted spiced ginger cookies or these addictive stilton and walnut stars? 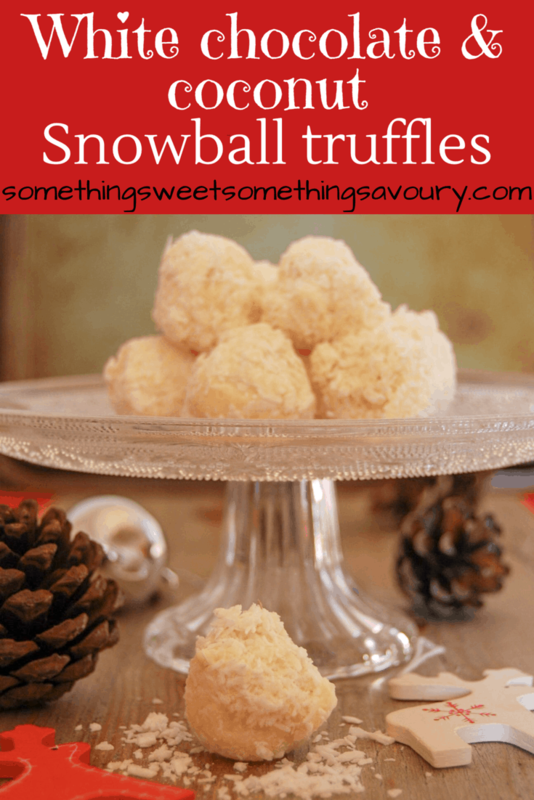 These festive looking white chocolate snowball truffles make a lovely Christmas gift and they really don’t take much effort to make – you can make up the chocolate mixture in the evening, pop it in the fridge and make the truffles in the morning if it’s easier. You can make them up to 5 days before you need them – another bonus! They keep very well in the fridge. I’ve used lemon extract to give a little zesty twist to the truffles, but if you wanted you could just use vanilla extract instead. It’s worth using the best quality white chocolate you can get your hands on for this recipe – I’m usually an advocate of using the value supermaket chocolate bars for baking, but they just don’t cut the mustard here. I use Callebaut white chocolate callets – they melt quickly and smoothly, taste delicious and the price of a 1kg bag is actually just about the same price as 1kg of supermarket chocolate. And you’re getting a far superior product for around the same price delivered directly to your door, so for me it’s totally worth it. Cool hands – When you’re rolling rolling rolling the truffles, it really helps if your hands are cold. If your hands are too hot, it gets pretty sticky! So cold hands are good here! Coconut – You can use any type of dessicated/shredded coconut here, but I love Baker’s angel flake sweetened coconut. I can (and often do!) eat it straight out of the bag! You really need to melt the chocolate nice and slow to prevent it from seizing up – I’ve never had a problem with Callebaut chocolate before, but white chocolate can be pretty temperamental. It has a lower burning point so can overheat very quickly, resulting in a lumpy, grainy mess. Melting the mixture slowly in a bowl set over a pan of barely simmering water set over a low heat will help prevent this. Disclosure – this post contains affiliate links, which means that I will earn a small amount of commission (at no extra cost to you) if you decide to purchase the items advertised, which in turn helps me to bring you all these recipes for free…thank you! I’m linking this recipe up to #CookBlogShare, hosted this week by Corina of Casa Costello. This post was originally posted on 16th December 2013. Updated on 18th November, 2018 with new photographs. 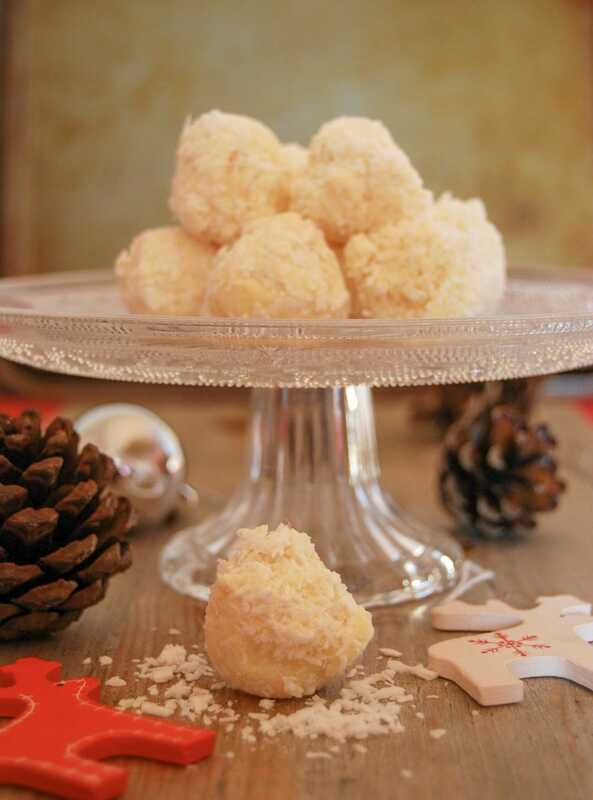 These easy, melt in the mouth white chocolate coconut truffles would make a lovely Christmas gift! Over a low heat, slowly melt the chocolate, cream, lemon extract and butter together in a heatproof bowl set over a pan of barely simmering water. Don't let the bottom of the bowl touch the water. When the mixture is melted and smooth, take off the heat and pour onto a small tray lined with baking paper. Place in fridge for at least 1 hours to set. Using your hands, roll the melted chocolate mixture into little balls. Place each truffle on a piece of clean baking paper. When you're finished, pop them in the fridge to firm up for about one hour. You can leave them for longer if it's easier. When you're ready, melt your 200g chocolate. Place your coconut on a flat plate. Take your truffles out of the fridge. Using a fork to help you, quickly dip each truffle in the melted chocolate. Then roll generously in the coconut. Pop your truffles back in the fridge to firm completely. Makes 15-20 large or 25-30 bite sized truffles. They will keep up up to one week in the fridge stored in an airtight container. If you prefer, you could use vanilla extract instead of lemon. I love these, so festive. Perfect for giving as gifts this time of the year. White chocolate and coconut…count me in! Thanks Julie. These truffles were given to my boys teachers. I had to of course test a couple for quality control 😉 Merry Christmas! ohh yes please, you can not beat a loving home made chocolate truffle and these sound delicious. Home made gifts are the best. Thank you Jacqui – home made us definitely the best! ? I love these little morsels coated in coconut! Coconut is one of my fav cookie flavors. Sounds delish!